The harsh conditions in recycling and waste processing facilities can easily take their toll on heavy equipment. For this reason, having access to the right replacement parts is essential. When something goes wrong with one of your key machines, quality parts help ensure repairs are done properly and that the problem doesn’t recur prematurely. For Cat® waste handling machines, Gregory Poole is your exclusive parts supplier in eastern North Carolina. We sell and service the company’s most advanced equipment, and we have one of the largest catalogs of replacement parts in the country. Make us your first call for any repair or maintenance issue. 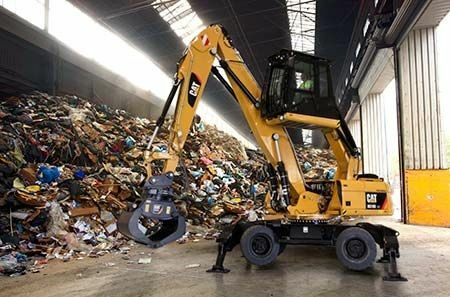 Cat waste handling equipment includes features such as specialized guarding and puncture-proof tires. These are essential for withstanding the rigors of waste and recycling processing. When any of them requires replacing, choosing a used or aftermarket alternative over genuine OEM can have serious consequences for your productivity. Only new OEM parts can deliver the protection and performance you need, and only new components are guaranteed to be free of wear and tear. New OEM parts may be more expensive, but they deliver better long-term value in any facility where maintaining uptime is essential. Parts.Cat.com is the easiest, most convenient way to order the parts you need online. This secure online portal contains up-to-the minute information about pricing and availability for more than 800,000 items. Place your order at any time, and Gregory Poole will fulfill it automatically, typically the follow business day. In fact, we can deliver 97.5% of all orders — both online and off — in 24 hours or less. At Gregory Poole, we understand how important even the smallest part can be to your productivity. Enjoy delivery to your door or to any of our 17 drop-off locations throughout eastern NC. Whatever the job requires, Gregory Poole will work with you to get you the new OEM parts you need. Since 1951, we have been an important partner to waste processing and other industries. Let our expertise benefit you. Call, email or fax your order today for service from the Cat equipment pros.